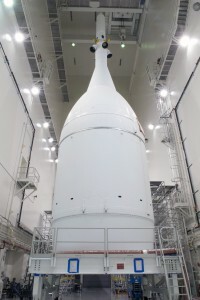 Lockheed Martin and United Launch Alliance (ULA) have jointly decided to postpone by 24 hours the move of the Orion spacecraft from NASA Kennedy Space Center’s Launch Abort System Facility to Cape Canaveral Air Force Station Space Launch Complex 37. The forecast Monday evening calls for winds and lightning that violate the constraints established for safely moving Orion. 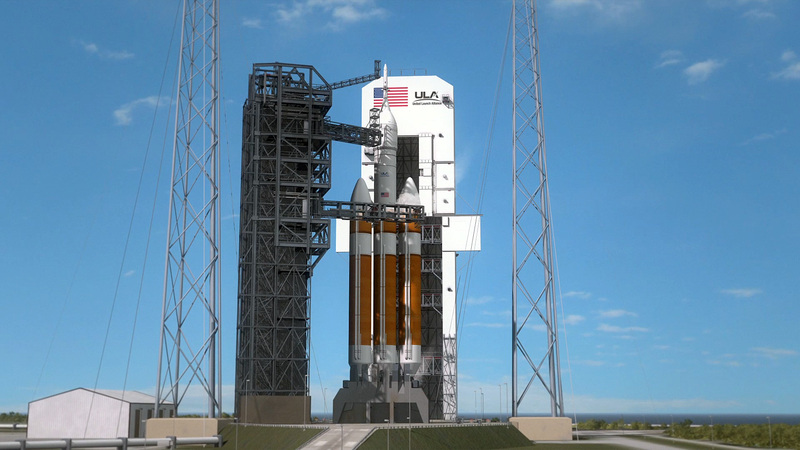 The delay will not affect the planned Dec. 4 launch of Orion atop a ULA Delta IV Heavy rocket. Engineers and technicians have completed their careful work in preparing the Orion spacecraft for launch and the time has come to move the next generation spaceship to the launch pad to United Launch Alliance’s waiting Delta IV-Heavy rocket. The move is the latest major milestone ahead of the launch of this first flight test which will be flown without a crew. 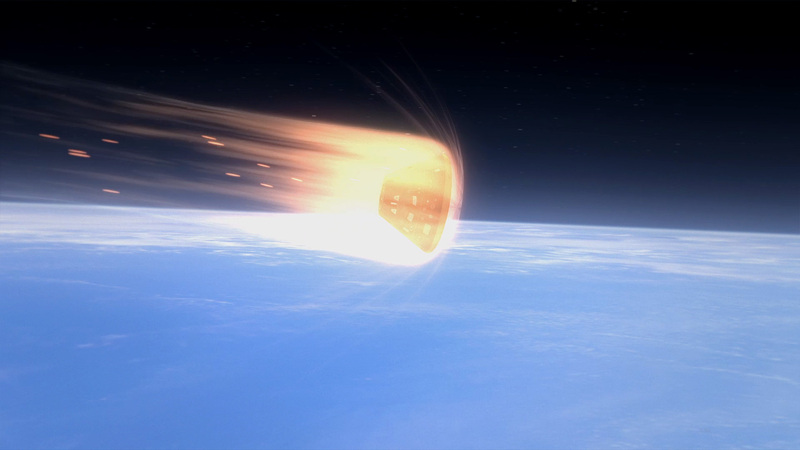 The mission was designed to make sure the spacecraft and heat shield can handle the stresses envisioned for future flights that call for Orion to safely take astronauts beyond low Earth orbit to deep space destinations including asteroids. 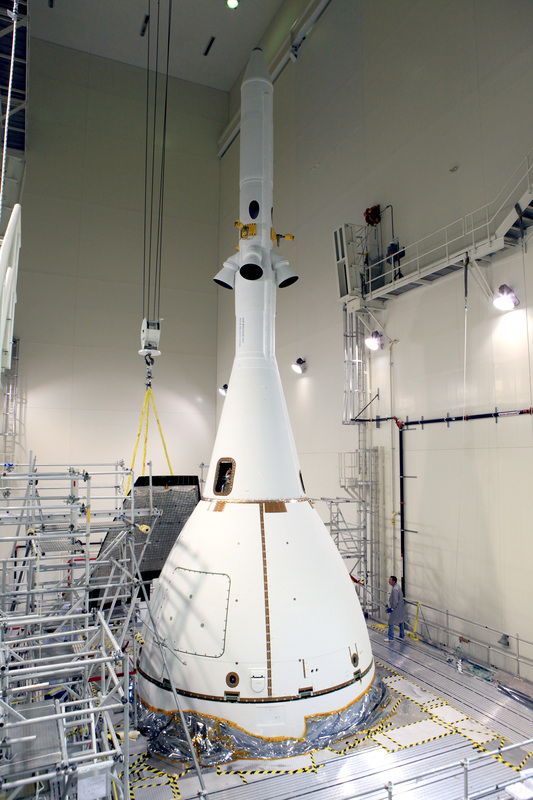 Orion is a vital element in NASA’s plan to eventually send astronauts on a journey to Mars. Tonight though, Orion’s trip is confined to NASA’s Kennedy Space Center and Cape Canaveral Air Force Station. A news briefing at 4:30 p.m. ET will precede the move and include comments from Bob Cabana, director of Kennedy, Ellen Ochoa, director of NASA’s Johnson Space Center, Mark Geyer, Orion’s program manager, and Mike Hawes, Lockheed Martin Orion program manager. The trip will begin at 8 p.m. at the Launch Abort System Facility where a 52-foot-tall protective fairing and the launch abort system were attached to the 10-foot, 11-inch-tall crew module. 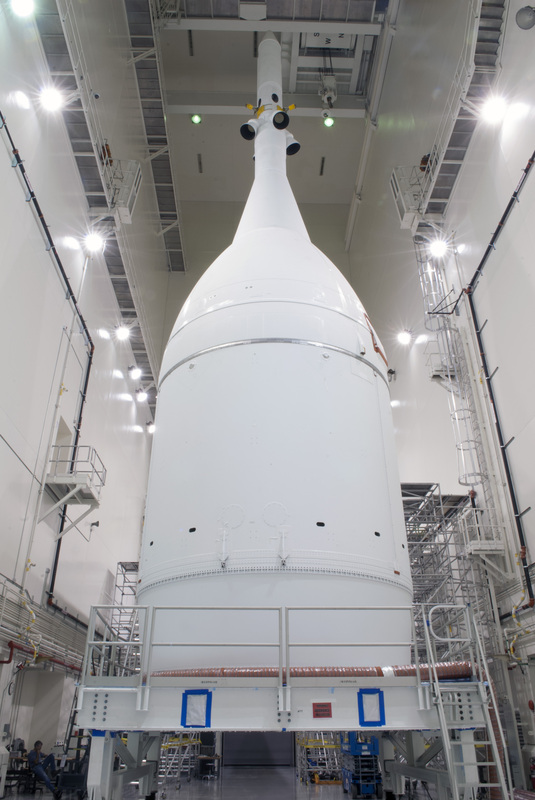 About six hours later, around 2 a.m., Orion will arrive at Space Launch Complex 37B. 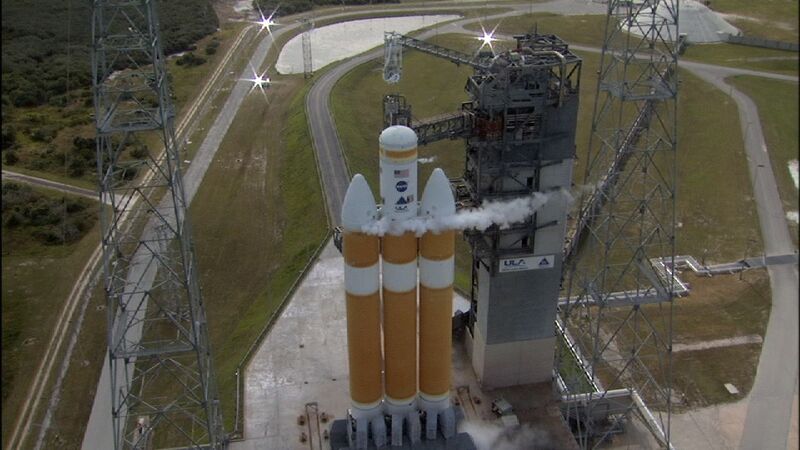 Orion will be lifted to the top of the Delta IV Heavy later that morning. All of which sets the stage for a liftoff December 4 at 7:05 a.m. EST on a mission that will see Orion fly about 3,600 miles above Earth during two orbits before returning to the planet and splashing down in the Pacific Ocean. It’s an important first step toward NASA’s next giant leap. NASA’s Orion spacecraft is set to roll out of the Launch Abort System Facility (LASF) at NASA’s Kennedy Space Center in Florida to its launch pad at nearby Cape Canaveral Air Force Station’s Space Launch Complex 37 on Monday Nov. 10, in preparation for liftoff next month on its first space flight. At 4:30 p.m. EST, NASA Television will air a news briefing live from the LASF before Orion’s move. Participating will be Robert Cabana, Kennedy Space Center director; Ellen Ochoa, Johnson Space Center director; Mark Geyer, Orion Program manager; and Mike Hawes, Lockheed Martin Space Systems Company director of Human Space Flight Programs. The spacecraft will start its journey to the launch pad at 8 p.m. The rollout will not be carried live on NASA TV, but highlights of the move will air on NASA TV’s Video File segments and the agency’s website starting Tuesday morning, Nov. 11. 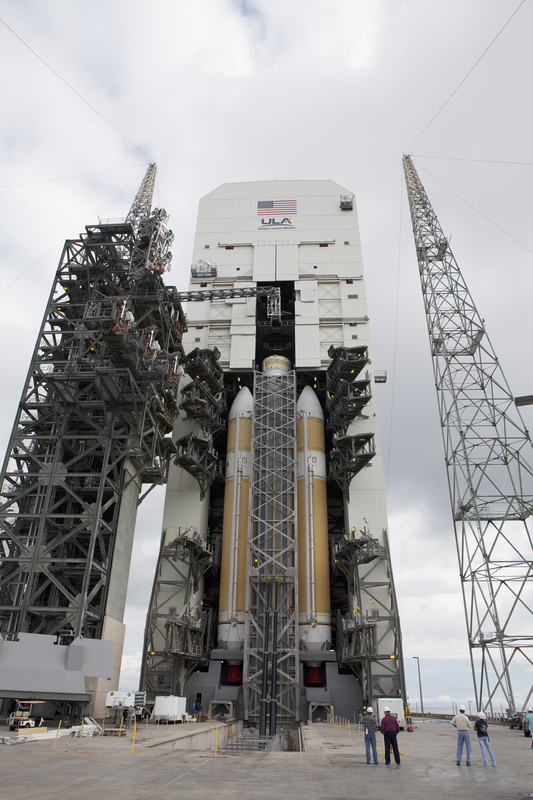 The spacecraft is expected to reach Space Launch Complex 37 at about 2 a.m., Tuesday. Some of the key players in the Orion flight test will discuss the goals of the first spaceflight for NASA’s newest spacecraft along with the elements of the mission itself during a televised briefing today from NASA’s Kennedy Space Center in Florida. The briefing will begin at 11 a.m. EST and can be seen on NASA TV and on the NASA TV stream on the web at www.nasa.gov/ntv. Orion will not carry a crew during this first flight test, but will be sent into orbit atop a United Launch Alliance Delta IV Heavy rocket. It will make two orbits of the Earth reaching out about 3,600 miles, 15 times farther than the International Space Station. In a critical element of the test mission, the spacecraft will head into Earth’s atmosphere at high speed to evaluate Orion’s heat shield. That is important because the Orion is designed to take astronauts into deep space on missions to asteroids and eventually Mars. Returning to Earth on such missions means the spacecraft will reenter the atmosphere much faster than previous spacecraft, so the Orion will encounter more heat and thus its shielding will need to be strong enough to handle it. The launch teams that will work together Dec. 4 to launch the Orion spacecraft practiced the countdown today that will included fueling the core stages of the Delta IV Heavy rocket that will lift Orion on its unmanned flight test. Working in control rooms at Cape Canaveral Air Force Station in Florida, countdown operators followed the same steps they will take on launch day. The simulation also allowed controllers to evaluate the fuel loading and draining systems on the complex rocket before the Orion spacecraft is placed atop the launcher next week. The Delta IV Heavy – seen on the left as it was when rolled to the pad – is made up of three core stages, each powered by cryogenic liquid oxygen and liquid hydrogen, some of the coldest materials known. The second stage of the rocket also uses the same cryogenic propellants. During the actual flight test, Orion will be launched on a two-orbit mission that will reach 3,600 miles above Earth and take the spacecraft more than 60,000 miles before Orion’s heat shield is tested with a high-speed reentry through the atmosphere. That portion of the test will give engineers what they need to make sure the heat shield can withstand the searing conditions of bringing back astronauts from missions into deep space destinations including, eventually, Mars. Orion is launching December 4 on its first test flight. This launch involves more than just a rocket that goes WOOSH! Orion will reach a height of 3,600 miles—15 times higher than the International Space Station—and orbit the Earth twice during the 4.5 hour mission. Want a closer look at what will take place during flight? 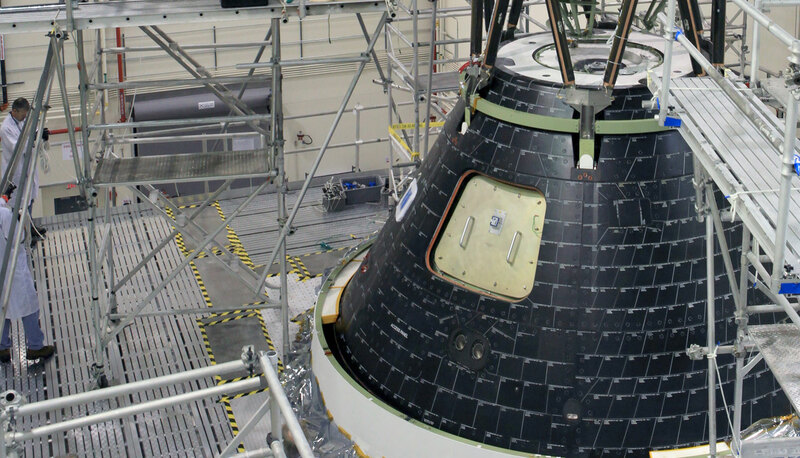 Here are the eight things you can expect to see on Orion’s first flight. It’s going to be loud. It’s going to be bright. It’s going to be smoky. Engines are fired, the countdown ends and Orion lifts off into space atop the United Launch Alliance Delta IV Heavy rocket from the launch pad at Cape Canaveral in Florida. It’s time to fly! The protective panels surrounding the service module are jettisoned and the launch abort system separates from the spacecraft. Orbit 1 is complete! The upper stage will now fire up again to propel Orion to an altitude of 3,600 miles during its second trip around Earth. It’s now time to prepare for reentry. The service module and upper stage separate so that only the crew module will return to Earth. 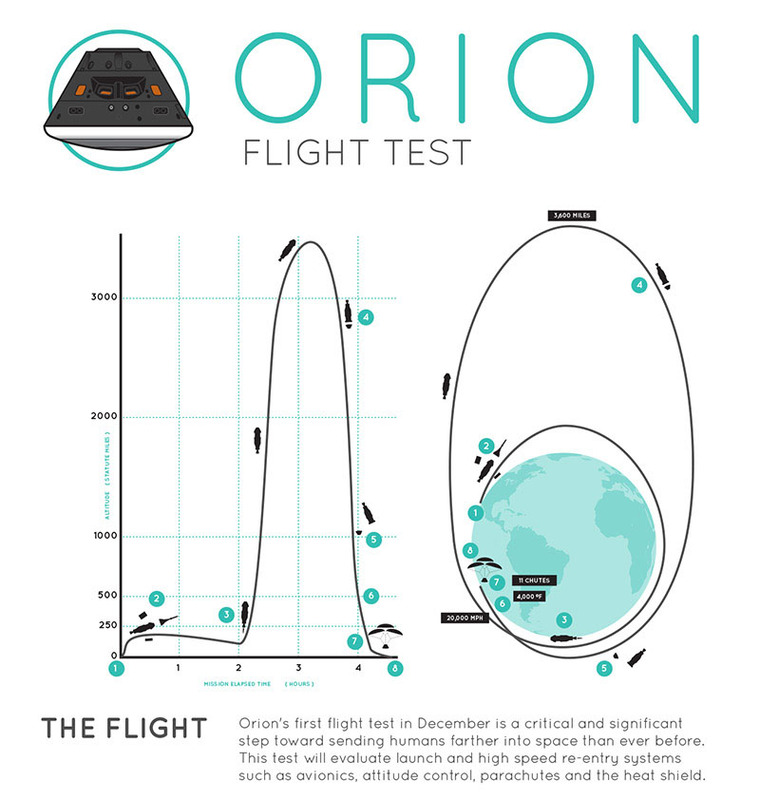 Orion’s first flight will be uncrewed, but that doesn’t mean we can allow Orion to return to Earth upside down. This test flight will help us test the control jets to ensure that they can orient the capsule in the correct reentry position. Things are heating up as Orion slams into the atmosphere at almost 20,000 mph and encounters temperatures near 4,000 degrees F.
After initial air friction slows the capsule from 20,000 mph, Orion will still be descending at 300 mph—too fast for a safe splashdown. A sequence of parachute deployments will create drag to further slow the spacecraft to a comfortable 20 mph. Orion will splashdown in the Pacific Ocean off the coast of Baja California, where it will be recovered with help from the United States Navy. Orion’s first flight has been successfully completed. Next step: deep space. See this graphic as one page. 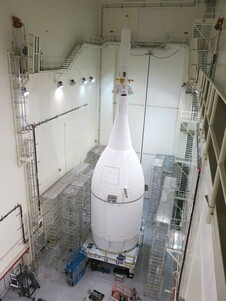 NASA’s new Orion spacecraft received finishing touches Thursday, marking the conclusion of construction on the first spacecraft designed to send humans into deep space beyond the moon, including a journey to Mars that begins with its first test flight Dec. 4. The assembled Orion crew module, service module, launch abort system and adapter will reside in Kennedy’s Launch Abort System Facility until its scheduled rollout to the launch pad, set for Nov. 10. At the launch pad, it will be lifted onto the United Launch Alliance Delta IV Heavy rocket that will carry it into space for its uncrewed flight test. The December flight test will send Orion 3,600 miles from Earth on a two-orbit flight intended to ensure the spacecraft’s critical systems are ready for the challenges of deep space missions. During the 4.5-hour flight, called Exploration Flight Test-1, Orion will travel farther than any crewed spacecraft has gone in more than 40 years, before returning to Earth at speeds near 20,000 mph and generating temperatures up to 4,000 degrees Fahrenheit. 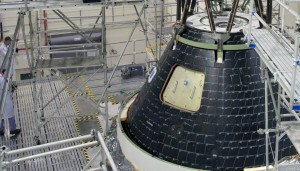 Engineers installed a four-piece fairing over Orion during the weekend as the spacecraft continues its steady march toward launch in December. 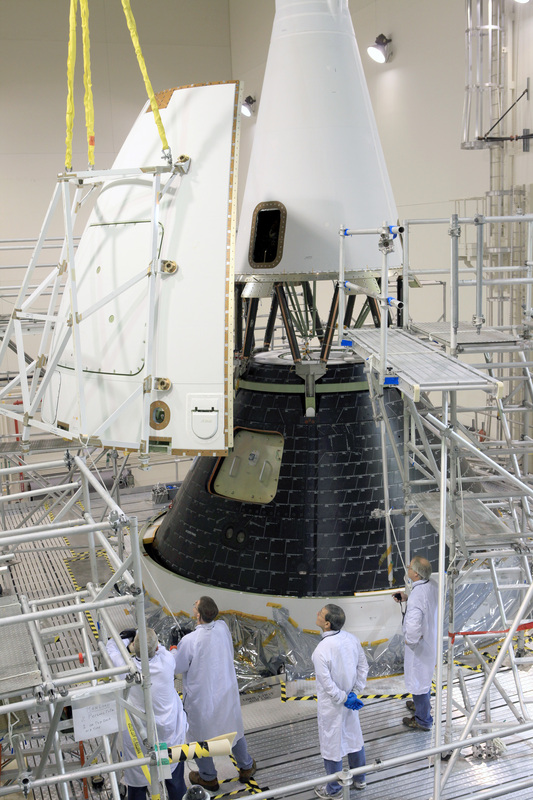 The panels will smooth the airflow over the conical spacecraft to limit sound and vibration, which will make for a much smoother ride for the astronauts will ride inside Orion in the future. 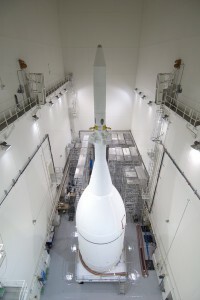 The work marked the final major assembly steps for the spacecraft before it is taken to the launch pad in November and hoisted to the top of a Delta IV Heavy rocket that will launch it on a four-hour, two-orbit flight test. Orion will fly without a crew on this flight test, but is being designed to take astronauts beyond Earth orbit on missions to deep space to explore an asteroid and eventually Mars. NASA’s Orion spacecraft is preparing for its upcoming flight test in December, and you can submit your name to be flown on the flight! Submit your name by following this link and your first and last name will be digitized and placed on a dime-sized microchip that will be stowed inside the uncrewed Orion spacecraft as it makes two orbits reaching up to about 3,600 miles above Earth before coming back and splashing down in the Pacific Ocean. Your name will also make it farther out into space on future exploration missions by NASA, too! You have until Oct. 31 to sign up to send your name into orbit and take this chance to write your name across the sky.